23.07.2005 It is a two-hour extravaganza, which is theoretically viewable by a 300 million TV audience. 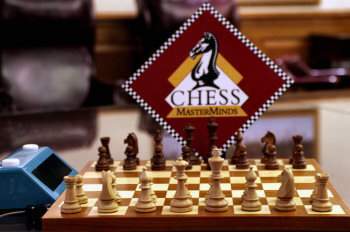 A chess match between teams from Russia and the USA, playing against each other via the Internet. In the studio live commentary, and a bluegrass band called Bering Strait. You can watch it tomorrow on terrestrial, satellite, cable or web TV. Come and watch. For those in the US here's the TV listings and check the bottom for those who want to watch it via the web. I will be recording this by the way. The two-hour chess show will be broadcast to a potential audience of more than 300 million people worldwide. The local channel number may be off. Please be sure to check or double check your local listing. The show will air on July 24 at 12 PM ET (NY time).